It is Fowl Friday with Fran & Freda AND moving day! Actually we aren't really do much moving as we are boxed up in our nest inside of one of the many bird cages Debra seems to collect! Freda was sure we would be riding in style in the front seat of a limo to our new home but I told her basically "when pigs fly". We are lucky we are in a bird cage and not encased in bubble wrap in a large moving box! 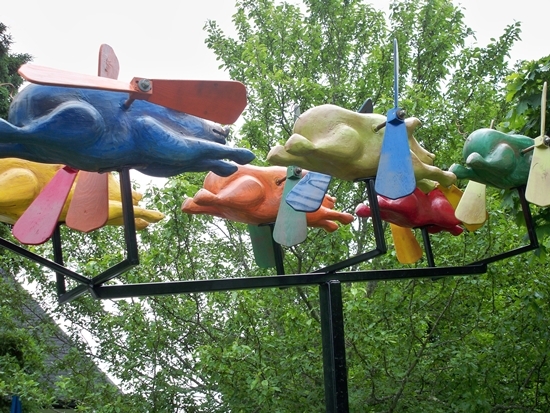 Speaking of "when pigs fly" which means something is totally absurd, not ever going to happen. The origins of the phrase are traced back to the Scots probably in the 1600's, they have a dry sense of humor as well as being witty. Lewis Carroll in Alice in Wonderland has the Queen using the expression and is probably the first well known reference to the phrase.